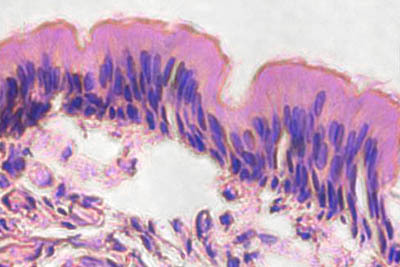 This histology slide (1) is from trachea and shows ciliated pseudostratified columnar epithlium. Cilia is visible on the apical surface. Notice that the nuclei are at all different levels. Compare the positioning of the nuclei in pseudostratified epithelium (1) to the nice neat row formed by the nuclei of the cells in simple columnar epithelium.